Zimbabweans should give President Emmerson Mnangagwa time to outline his economic recovery policies on which he should then be judged, Cde Christopher Mutsvangwa has said. Attacks on the President, who is barely 10 days in office, were premature and unfair, he said. 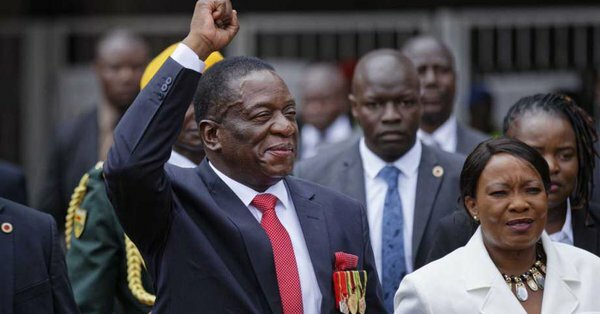 President Mnangagwa was sworn in on November 24 as the country’s second Executive President following a dramatic end to former President Robert Mugabe’s 37-year rule. “Leave our President alone. Give him a chance. He means well for Zimbabwe and the people of Zimbabwe are solidly behind him. Please do not try him before he has even started. Don’t condemn him before he has even started,” said Cde Mutsvangwa during an address to the Mashonaland West provincial coordinating committee meeting yesterday. Cde Mutsvangwa, who has been nominated as Special Advisor to the President, said President Mnangagwa’s main focus would be reviving a stricken economy. “We cannot have a country of people without any purpose because the economy is not providing them with opportunities which they want. The focus of the President, immediately, is how to revive this economy. That is where his attention is focused on,” he said. He said the sacrifices of all people – past and present – in the liberation movements were not only for the flag, a leader or party, but to develop a prosperous country. The current focus was to develop the country into the best destination for business in the world, which in turn would grow the economy and better livelihoods, he said. “The route which we have taken is the route of wealth, the route of money, prosperity and building a model African country, which no other African has ever done. The route of having an economy that grows at a rate of 10, 15, 20 percent per annum for the next 10 to 20 years,” said Cde Mutsvangwa. The country will witness the construction of skyscrapers and highways anchored on judicious exploitation of the country’s mineral wealth. He said smelting plants would be set up along the Great Dyke to contribute to the country’s economy through production of steel. The opposition, Cde Mutsvangwa said, had not raised a finger when G40 was taking root in the country, only to find their voice to criticise the new administration. G40 is a group of politicians reportedly fronted by the former First Lady Grace Mugabe to fight then Vice President Mnangagwa. Turning to the new Cabinet, Cde Mutsvangwa said the President had reached out to the opposition, but MDC-T leader Morgan Tsvangirai insisted on seconding people of his choice. The war veterans leader said Cde Mnangagwa, who is fulfilling ZANU-PF’s mandate, had identified people in the opposition he thought he could work with. Mr Tsvangirai, however, proposed his own list. “In setting up Government, President Mnangagwa is using the mandate that former president (Cde) Mugabe got in 2013. He has not secured his own. He is waiting for his own mandate in 2018,” said Cde Mutsvangwa. This, he said, scuppered plans to co-opt people into Government from the opposition as they were threatened with expulsion. The move to include the opposition was informed by the unity shown when thousands of Zimbabweans across the political, racial and ethnic divide marched in support of the intervention of the Zimbabwe Defence Forces which forced then President, Cde Mugabe, to resign. Blocking President Mnangagwa from selecting people of his choice proved to be the deal breaker, said Cde Mu- tsvangwa. “To block someone with a mandate to fish from the opposition ranks to form Government when you lost in 2013 was too much. They were intruding on the mandate of the President,” said Cde Mutsvangwa. As a result, he said, some sections of the media had changed stance and started vilifying President Mnangagwa as a failure when he spent only a week in office. Cde Mutsvangwa also said President Mnangagwa, as a lawyer, was following the law by appointing people who were elected into Parliament, with latitude of no more than five people from outside to include in his Cabinet. His ability to satisfy the various interests in the party, Cde Mutsvangwa said, was also governed by existing structures. He called on people to mobilise for prospective candidates that can make a difference in Government. He said the inclusion of military personnel in Government was common in the West and America. “The choice of the President to include members of the Zimbabwe Defence Forces is his prerogative, moreso when they are loyal, patriotic and competent. There is no law in the world which says generals cannot be found in Cabinet. For example, General John Francis Kelly, is currently White House Chief of Staff in President Trump’s administration. Another retired United States general, Michael Flynn, served briefly as National Security Advisor to President Trump. There are only two military personnel – Air Marshal Perrance Shiri (Minister of Lands, Agriculture and Resettlement) and Major-General Sibusiso Moyo (Foreign Affairs and International Trade Minister) – in President Mnangagwa’s 22-member Cabinet. “Did they say the American government is a military junta? These are double standards. We condemn any fingerpointing at our illustrious army. Stay away from fingerpointing at our army. It is the best in the world,” he said.